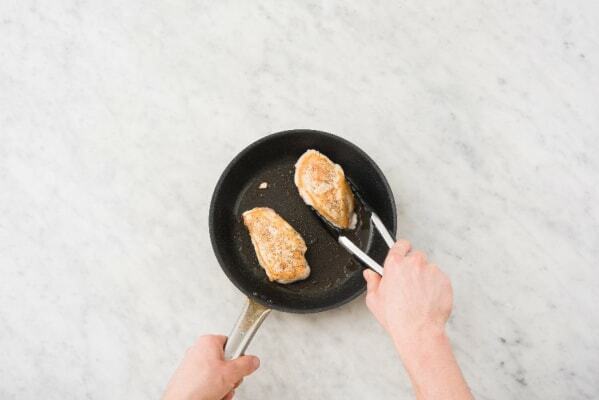 Chicken breasts are a reliable go-to for dinner—easy to cook and pleasing to just about every palate. But let’s face it: they can be a little boring sometimes. 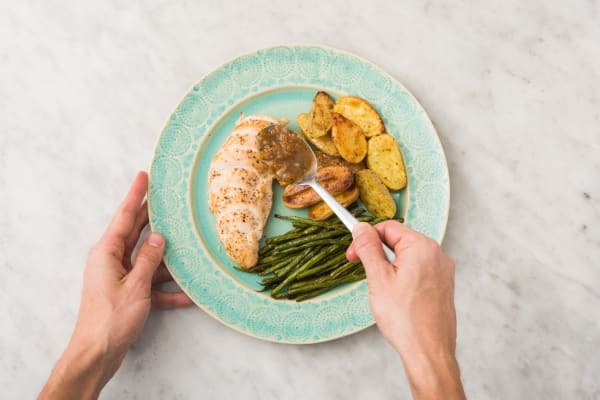 Which is why we’ve enlisted the help of a lively sauce made with apricot jam: it coats each bite of meat in stone-fruit sweetness and even tastes great drizzled onto the potatoes and roasted green beans on the side. Adjust rack to middle position and preheat oven to 425 degrees. Wash and dry all produce. Halve potatoes lengthwise. 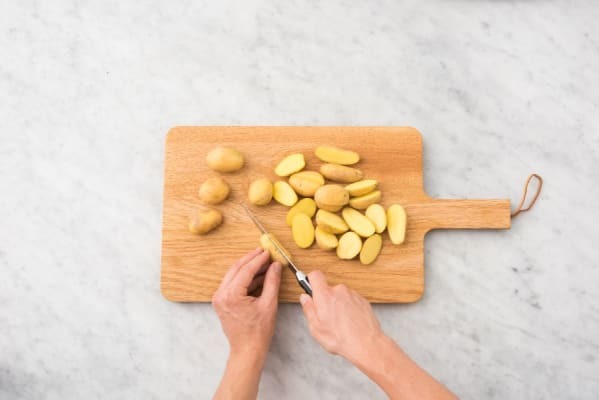 Toss on a baking sheet with a drizzle of olive oil and a pinch of salt and pepper. Roast in oven until tender and lightly browned, 20-25 minutes total (we’ll add more to the sheet after 10 minutes). 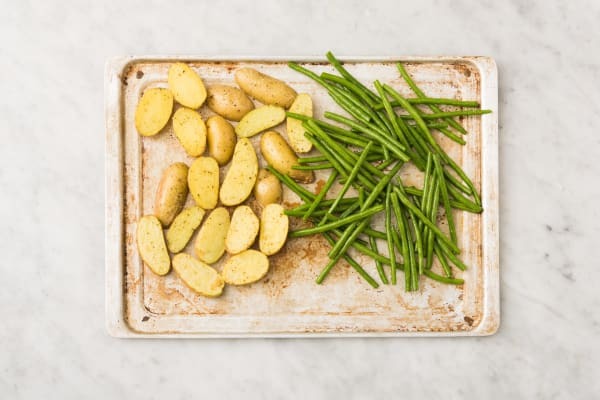 Once potatoes have roasted 10 minutes, remove sheet from oven and give them a toss, pushing toward one side. On other side of same sheet, toss green beans with a drizzle of olive oil and a pinch of salt and pepper. Return sheet to oven and roast until potatoes are done and green beans are lightly crisped, about 10 minutes. Halve and peel shallot. Finely mince one half; save the other for another use (like adding to salad dressing). Heat a drizzle of olive oil in a large pan over medium-high heat. Pat chicken dry with a paper towel, then season all over with salt and pepper. Add to pan and cook until no longer pink in center, 4-5 minutes per side. Remove from pan and set aside to rest. Lower heat under same pan to medium and add shallot, thyme, and a drizzle of olive oil. Cook, tossing, until softened, 2-3 minutes. Stir in apricot jam and 1 TBSP vinegar (we sent more). Simmer until syrupy, about 1 minute. Stir in 1 TBSP water and stock concentrate. Simmer until thickened, about 3 minutes. Remove pan from heat, add 1 TBSP butter, and stir to melt. 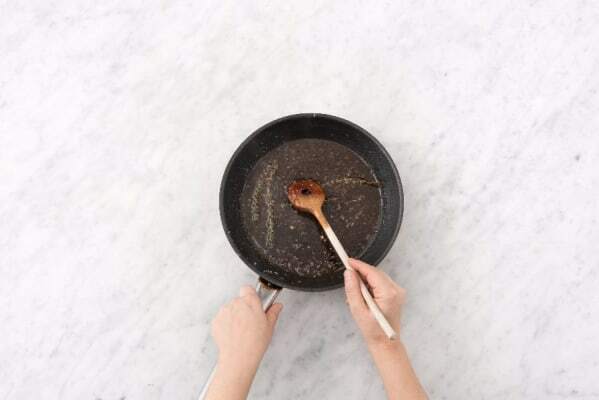 TIP: Stir in a splash of water if sauce is very thick. Discard thyme from pan. Give sauce a taste and add more vinegar if you prefer a tangier flavor. Season with salt and pepper. 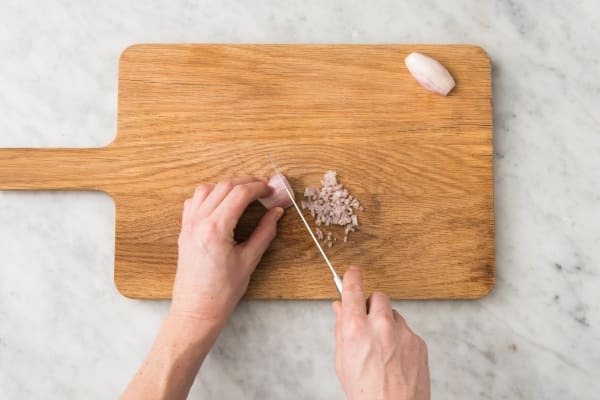 Slice chicken. 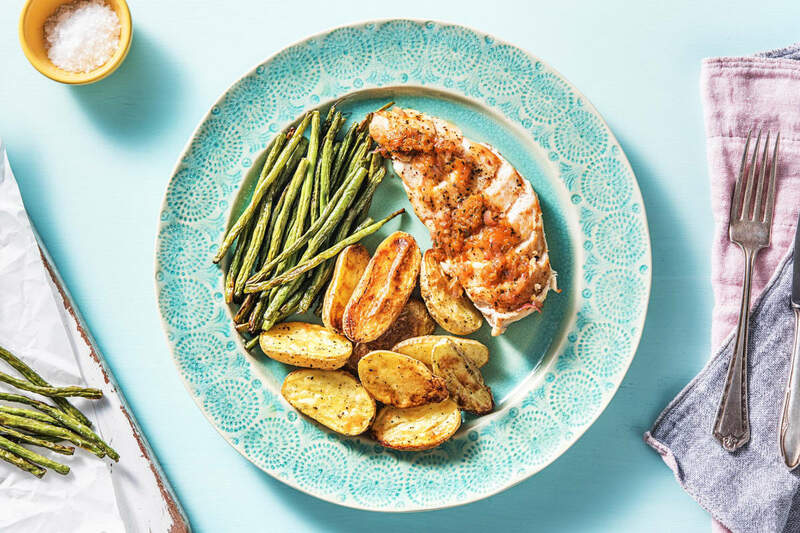 Divide chicken, green beans, and potatoes between plates. Drizzle sauce over chicken and serve.